Please refer to our stock # 10917 when inquiring. 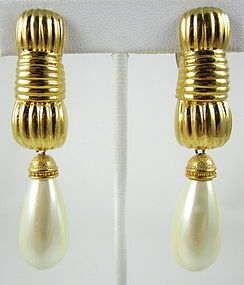 These lovely vintage earrings by Fendi are 2 3/4" long x 5/8" wide and both have bright polished gold tops. They have acrylic pearl drops and the reverse clips are signed "Fendi". They are in very good condition and guaranteed authentic.